Most piano manufacturers sell more than one "line" of pianos. For example in addition to their name brand, Steinway also sells pianos under the brand names Boston and Essex. Note: a listing on this page does not imply a recommendation on the part of Mitchell Piano Service. Links and references are provided only for convenience. For recommendations, please contact me directly. If you are in the market for a new or used piano, I highly recommend getting copies of Larry Fine's books: "The Piano Book" and "The Piano Book 2007-2008 Supplement". These are rich in information on buying pianos, histories of piano brands, relative comparisons of brands and retail pricing information. A rare Byron Mauzy Grand Piano. 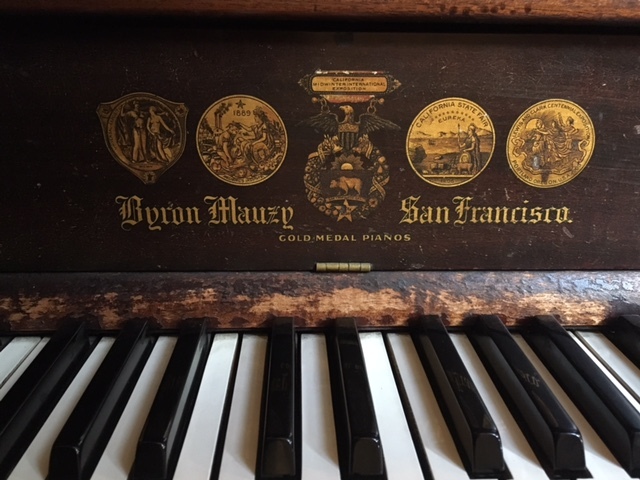 To my knowledge, Mauzys were the only production piano ever made in San Francisco. This one is located in the Elks Club on Post Street.